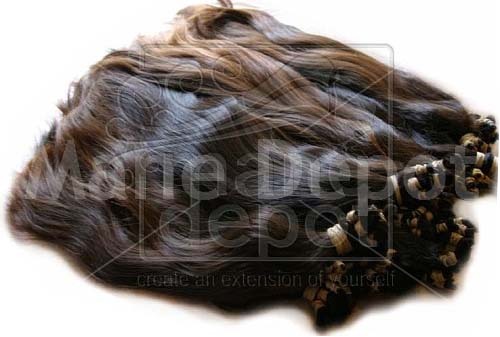 Virgin Brazilian Hair imported from the South American tropic regions of Peru, Argentina, Brazil and Venezuela. Genetically, most Brazilians have some degree of European, African, and Amerindian ancestry which is why there’s such a unique and varied texture quality to Brazilian hair and more brown shades above 1B and 2. Our Belorio line of Brazilian hair is not gathered through the practice of tonsure like Indian hair. Our hair comes from a thriving Latin American economy. It is cleaner, healthier hair and received as original bulk ponytails. Belorio Virgin Brazilian Remy is cut directly from the donor and sent to us in correct cuticle alignment. The hair is black to off black and variations of rich brown. In some of our wefts, we’ve custom blended colors together to achieve beautiful multi-tone color. Wefts are single drawn with varying shorter lengths which requires less razoring and easier blending. Mane Depot carries only 100% Remy genuine, authentic Brazilian hair in straight texture and glorious waves and eye-popping curls. We offer bulk hair for pretipping, ventilating and wefting or you may select ready to wear hair on machine wefting. We have one of the best custom wefts in the industry with a short return (the fold over hair at the weft) for optimum comfort and durability. We have another new shipment in this week and offer samples of all virgin Brazilian hair currently in stock. We also have a Fotki photo album featuring numerous photos of hair we’ve imported. Not sure where to go? Go to Mane Depot Brazilian Hair! This entry was posted on Friday, September 18th, 2009 at 2:27 pm	and is filed under Mane Depot Store. You can follow any responses to this entry through the RSS 2.0 feed. Both comments and pings are currently closed.